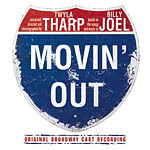 Movin' Out is a jukebox musical featuring the songs of Billy Joel. Conceived by Twyla Tharp, the musical tells the story of a generation of American youth growing up on Long Island during the 1960s and their experiences with the Vietnam War. The principal characters are drawn from those who appeared in various Joel tunes: high school sweethearts Brenda and Eddie ("Scenes from an Italian Restaurant"), James ("James"), Judy ("Why Judy Why"), and Tony (Anthony in "Movin' Out"). The show is unusual in that, unlike the traditional musical, it essentially is a series of dances linked by a thin plot, and none of the dancers sing. All the vocals are performed by a pianist and band suspended on a platform above the stage while the dancers act out the narrative sans dialogue, making the show, in essence, a rock ballet.